Here's a collection of news related to honey, food, health and nutrition issues from 2010-2012 by Bee Healthy. The waste-processing plant for M&M's bite-sized chocolate candies has been identified as the cause of the production of unnatural shades of blue and green honey by the bees from the northeastern France apiaries. The honey is unsellable because it does not meet France's standards of honey production, resulting in a major set-back for the affected beekeepers who are already struggling with high bee mortality rates. Queen of the Sun: What are the Bees Telling Us? is Taggart Siegela's profound look at the global bee crisis. A remarkable film not to be missed. Here's the trailer. Need I say more...enter gallery to view them! Recent media reports of several beehives encounters in the neighbourhoods of Singapore have caught my attention. If you find it intriguing that these incidents are treated as news-worthy and are even reported by national media, you are probably not a local. Yes, by head-knowledge, the people here do know that bees are a vital part of the eco system, but in day to day living here, they are considered rare and dangerous, a menace. You have to understand that in a setting imbued with city ways and highly encroached by science, technology, and innovation, the bees and the creatures from the nature are not top of mind for the urban populace. 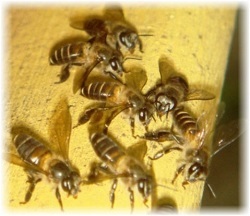 In fact, when beehives are ever sighted, they cause a stir and commotion, and are immediately reported, destroyed, and removed by the pest controllers. Hold on a second, this is bizarre, did you say "pest controllers"? Bees are feared? Yes, I did, but not erroneously. Hey, were you thinking of "beekeepers" instead?...Well, I'm afraid they don't exist here. 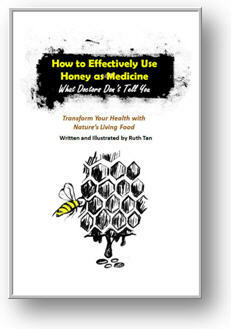 "How to Effectively Use Honey as Medicine: What Doctors Don't Tell You" is now in Amazon! Have a peek at the synopsis of this remedies journal by a honey frenetic from Singapore. April, 2010, Elephants are Afraid of Bees! Despite their massive size, elephants are afraid of being stung by bees. Strangely comforting, isn't it. In a false alarm, a California airport was shut down and evacuated after bottles of "a suspicious-looking liquid" in a passenger's luggage were tested positive for explosives, only to conclude later that they were actually honey. Even more incredibly, when the bottles were opened, two of the screeners reported of a strong chemical smell, complained of nausea and were rushed to the hospital. Questions remained as to how the honey was determined to be explosives by the detectors and had made the screeners so ill.